White House chief of staff John Kelly (left) and then-staff secretary Rob Porter leave the White House with President Trump last November. Porter, who had been working for months under an interim security clearance, was forced to resign in February after allegations of domestic abuse became public. In response to the scandal over White House security clearances, House Oversight Committee Chairman Trey Gowdy, R-S.C., wanted to know who knew what and when they knew it. But the White House response, which arrived eight days past Gowdy's deadline, doesn't address those questions and instead points to a Feb. 16 memo from chief of staff John Kelly discussing ways to improve the security clearance process. A spokeswoman for the Oversight Committee says that's "inadequate." 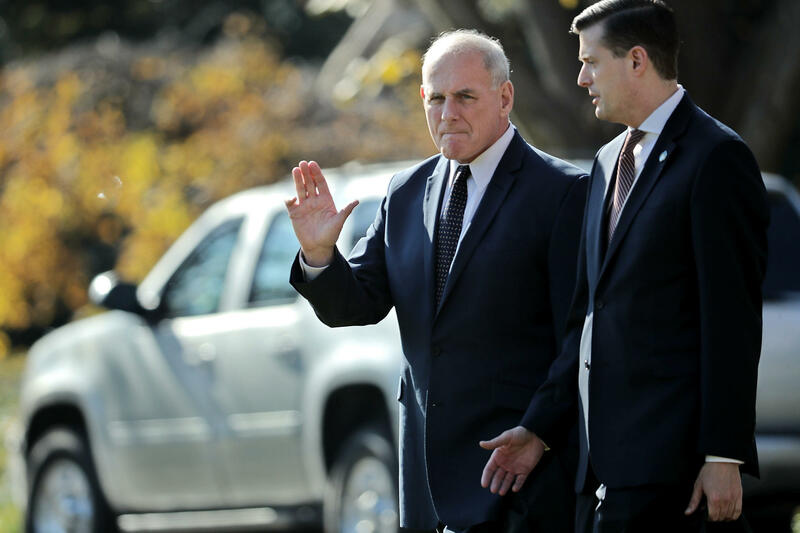 Questions about how the White House handles security clearances and why it had so many top aides operating with interim clearances arose from the sudden forced resignation of former staff secretary Rob Porter in early February. Porter's two ex-wives accused him of domestic abuse during background check interviews, but he was able to continue working at the White House on an interim clearance for months. Porter was forced out only after those allegations, including photos of his first wife with a black eye, went public. Porter has denied the allegations made by his ex-wives. On Feb. 14, Gowdy sent Kelly a letter asking a series of questions about how the Porter case was handled and requesting, among other things, "the date on which any White House employee became aware of potential derogatory or disqualifying information on Porter from the date of his appointment to February 12, 2018, and which individual was notified." In other words: Who knew what, and when? Gowdy gave a deadline of Feb. 28. In another letter the following day, Gowdy also requested a "a list of employees in the Executive Office of the President for whom a security clearance was pending or has been adjudicated since January 21, 2017." He asked for the dates the background investigations began and ended, the current status of all pending investigations and how those that have been completed were resolved. In an interview with CNN, Gowdy put a finer point on his concerns. "The chronology is not favorable from the White House," Gowdy said. "When you have the head of the FBI saying we told you three times in 2017 and once more in 2018 for good measure then I think the really fair questions are: What were you told, by whom were you told it, did you have some reason to question what the bureau told you, and if none of that is true, why did you keep him on?" Gowdy isn't getting answers to those questions — at least not formally from the White House. Responding with a letter on March 8, White House legislative affairs director Marc Short doesn't get into any of those specifics, focusing instead on efforts to fix what is broken. "The White House has acted to improve its security clearance procedures, which it inherited from prior administrations," the response letter from Short begins. "These efforts have included ending the granting of new interim clearances absent extraordinary circumstances." For several days now, White House spokespeople have said there were ongoing discussions with the committee about this. What isn't clear is whether the White House has shared more information with Gowdy through other channels or whether Gowdy is satisfied with the March 8 letter. His office has not responded to a request for comment. But the top Democrat on the Oversight Committee, Elijah Cummings, D-Md., is most definitely not satisfied. "Last night, we received a completely inadequate response from the White House regarding our Committee's request for information about security clearances," Cummings wrote in a letter to Gowdy. "In my opinion, the Trump White House — more than any other in recent memory — needs more congressional oversight, not less. The response last night from the White House is an affront to our responsibilities under the Constitution, and it degrades the integrity of our Committee." Cummings is asking Gowdy to subpoena the White House to get answers, though Gowdy isn't going that far yet. In a statement Friday afternoon, committee spokeswoman Amanda Gonzalez reiterated the feeling that the White House's letter came up short. "The Chairman finds the White House's response inadequate, and we have communicated to the White House that we expect full compliance," she said. "We are in the process of scheduling a meeting between Chairman Gowdy and the White House to discuss next steps."